Schools and groups are invited to join us for FREE gallery highlights tour at Mundaring Arts Centre. Gain an insider’s view and perspective into the themes of our exhibitions, as well as discover more about the creative arts in Mundaring. During the school holidays immerse yourself in the world of a creative artist and learn the art of acrylic painting with Alastair Taylor. You will learn how to capture a scene, explore colour and brush strokes to create a series of small boards to take home. Artist Marie Jacquier will help Blue Sky Festival participants make a flying creature using recycled and natural materials. Transform beautiful silken wool into a delicate angel and learn the art of felting to create a unique Christmas bauble, perfect for the Christmas tree or for someone you love. Please note: Children under 8 years are to be accompanied by an adult. Unleash your inner musical genius and learn the skills required to write your very own song in only 3 hours! During this interactive and action-packed song writing workshop, you will conquer the fundamentals of writing lyrics and creating melodies. This uniquely crafted workshop builds confidence in students to participate without judgement and create in a safe environment. Parents and guardians are welcome to attend at 1pm to watch a musical performance created by the group. Create your own porcelain Christmas decorations in fun filled workshop at the Midland Junction Arts Centre ceramics studio. In this session you will learn the art of embossing, slab building and incising to transform your clay into stunning objects in time for the festive season. Once fired the beauty and translucency of porcelain will be revealed. Participants can collect their fired pieces between 10am - 5pm Thu 20 or Friday 21 Dec.
A perfect gift, or something hand created to cherish for years to come! All, Kids, What a Tool? To celebrate all things 'tool' related at the What A Tool? Open Day at MJAC, try your hand at woodworking, and be inspired to create an artistic wooden sculpture of your choice. This workshop has no set project and is completely participant directed - a perfect opportunity for creative thinkers to try their hand at new skills. Tracey Laird from Perth Kids Shed will demonstrate woodworking techniques and assist in the use of drills, hammers, saws, screw drivers and a variety of other tools for participants to make their own take home sculptural creation. A range of shapes, sizes and types of wood will be provided for participants to as well as extras embellishments to enhance their creations. A small class size of 8 ensures individualised attention, be sure to book to ensure your spot. Exploring the many uses and applications of various ‘tools’, book in for a formal workshop or simply come along on the day and have a go. Watch artists transform the mundane to the magical using industry specific tools and explore how far technology has taken us with new tools you (may have) never seen before! Let your imagination run wild in this educational and easy-to-follow woodworking workshop with Tracey Laird. 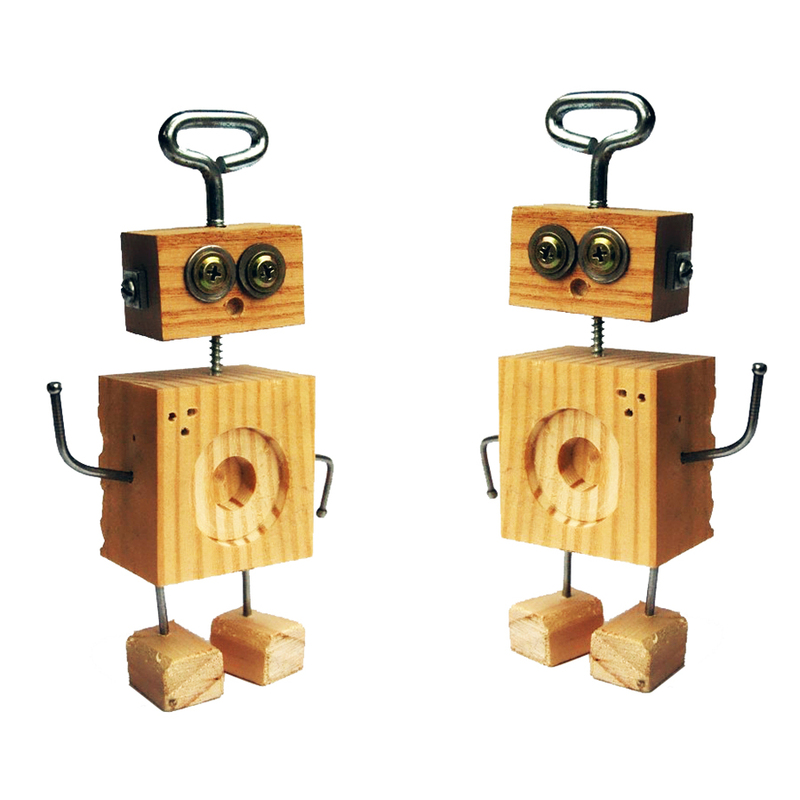 Participants will use hammers, screwdrivers, drills and saws to create robot beings from wood scraps and various other materials. Technology has become an essential tool for modern living and advances have re-defined how we live our lives. Virtual reality seemed like a pipedream for many years, but in recent years it has completely transformed. Avoid all pre-conceived ideas and create without limitations in this state of the art VR set up curtesy of the Ballajura Library. Paint with fire, sculpt with light, create under the stars or under the sea – the possibilities are endless! Exceptional advances in VR technology can only be experienced to be understood. Be warned, 5 minutes is just a taster of this amazingly addictive and fascinating technology. Courtesy of the City of Swan Libraries. This workshop has no set project and is completely participant directed - a perfect opportunity for creative thinkers to try their hand at new skills. Tracey Laird will demonstrate woodworking techniques and assist in the use of drills, hammers, saws, screw drivers and a variety of other tools for participants to make their own take home sculptural creation. Have a go using everyday tools such as pliers, ties, nails and hammers to construct your own small wood and wire sculpture. Renowned sculptor Jen Cochrane will assist you in your design as your adorn and paint your finished piece. Join master of animation Steven Aiton to create a collaborative stop motion animation, using the latest technology and old tools from the Midland Railyards. Look back with the Midland and Districts Historical Society Inc. The society will be displaying a large number of early photographs of Midland and the WA Government Railways Workshops (1904-1994). Society members will be on hand during the day to answer questions and impart their knowledge of the local area. Using rock, paper and scissors as both the inspiration and instrument, join artist Monique Bosshard-Curby in this experimental printmaking workshop and leave with a small series of unique prints. Lee Woodcock is working in residence at MJAC all week in the lead up to Open Day. Learn about the process of construction as he demonstrates the use of unique tools building a pot over 2 metres in size. Over 200 participants started the life-size zodiac boat structure at this year’s Avon Descent and we need your help to complete it! Join the Studio Payoka team and use cane, ties, tape and other tools to finish the colossal sculpture depicting a “tool” of transport. To celebrate the all things 'tool' related at the What A Tool? Open Day at MJAC, come and let your imagination run wild in this educational and easy-to-follow woodworking workshop with Tracey Laird from Perth Kids Shed. Participants will use hammers, screwdrivers, drills and saws to create robot beings from wood scraps and various other materials. With a small class size of 8, this workshop is a perfect opportunity to introduce participants to the basics of woodworking, while ensuring individualised support. Be inspired by Urban Art in this dynamic workshop with educator and street artist Dan Duggan. With over 20 years’ experience in the street art sphere Dan will discuss urban art and graffiti, creative tools and mediums and his own artwork. Working closely with the artist, participants will develop a design using spray-paints, paint markers and traditional acrylic paint to transfer designs onto large scale MDF circles. Dan will demonstrate the various techniques and application methods, using aerosols, brushes, rollers, stencils, palette knives, squirt bottles and recycled materials to create interesting textures and add extra dimension to the final pieces. The 90cm diameter circles will be used as suspended backdrops for the annual 'Worn Out Worn Art' Wearable Art Parade at MJAC on Sat 24 Nov. Come and see your resolved artwork displayed center stage for the performance and take your piece home the following week. Please wear old clothes and enclosed shoes. Aerosols and paints will be water based and masks will be provided. Barking Gecko Theatre Company and Mundaring Arts Centre have partnered up to offer an exciting school holiday drama workshop at the Midland Junction Arts Centre – the first of its kind! A fantastic introduction to improvisation and characterisation, this workshop will spark your curiosity with a taste of the very best drama games out there with a passionate and talented Barking Gecko teaching artist. This fun, fast-paced workshop is perfect for those new to exploring the wonderful world of acting and amazing for those that love all things drama! A great opportunity to experience the Barking Gecko ensembles held at MJAC on Saturdays throughout the school term. Unleash your inner musical genius and learn the skills required to write your very own song in only 3 hours! During this interactive and action-packed songwriting workshop, you will conquer the fundamentals of writing lyrics and creating melodies. This uniquely crafted workshop builds confidence in students to participate without judgement and create in a safe environment. Learn the "tools of the trade" with renowned WA silversmith and jeweller Bethamy Linton. Create your own unique pair of textured and embellished earrings whilst learning roll-printing metal, cutting and assembling techniques. 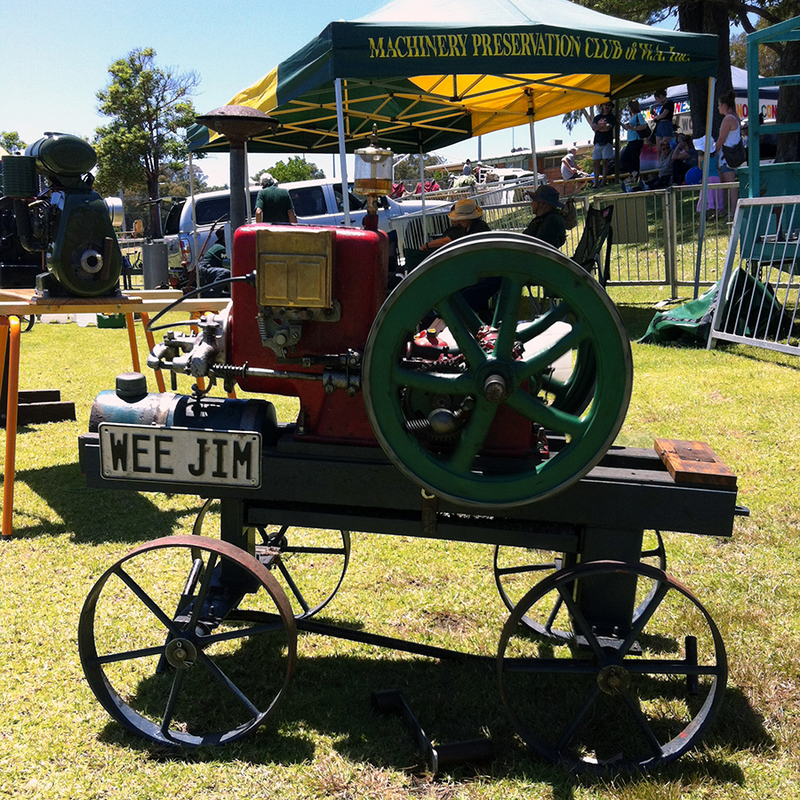 Learn about marvellous hand tools and steam engines with the members of the Men’s Shed, Machine Preservation Society, Fine Woodwork Association, Perth Wood School and Hand Tool Preservation Society of WA as they show their wares and chat with visitors about their respective clubs. Learn the lost skills of quilt making, stained glass, mosaic, card making with the ladies from the Mundaring Sharing. This Perth Hills group is renowned for their diverse talents and regular community classes. Drop by, purchase a boomerang bag and then stuff it full of handcrafted goodies. Worried about how to construct your next big D.I.Y project without getting hurt? See the amazing people at the Arbortech tent and learn about their specialist masonry and woodworking tools created from the vision of founder Kevin Inkster. “Inventing has always been a love of mine and most of our tools are a result of experimentation.” Today, Arbortech is internationally renowned for pushing the status quo. They are makers and innovators with a drive for creating unrivalled products that allow better, safer, easier and more enjoyable work. Learn the art of carving and casting to create your own wearable treasure. Join artist Sarah Elson as she shares her passion for metal working and helps you see the potential for creating unique forms. You will design, carve and pour your very own wearable sculpture in this session. White Peacock Studios will be doing demonstrations on wheel throwing and turning and giving you the opportunity to have a go and learn how to use the wheel. Our locally made ceramic wares will also be on show for you to purchase or just have a browse. Assisting people with disability to enjoy horse riding and equine care for 41 years, the Riding for the Disabled Hills Group showcases a range of adaptive tools for riding and demonstrate how to make a horse lead. Enjoy a tool-ish book from Boffins. Have a chat with the knowledgeable literary lovers and explore the vast array of wonderful books on show, Whatever your passion, there's a book for you at Boffins. Boffins is an independent bookshop operating since 1989. The Mount Helena Residents and Ratepayers are showcasing extraordinary Billy Carts and how to make them. Visitors are encouraged to take the instructions and then participate in the Billy Cart Festival to be held on 28 October in Mount Helena. Master Blacksmith Brian showcases his skills alongside his apprentice, artist Rachel Wyder. Utilising a charcoal forge and the ancient skill of shaping molten metal these artisans will share their skills and knowledge throughout the day. Join the talented artists from the Printmakers Association of WA, learn about printmaking tools and try your hand at the printmaking Have a Go station. Visitors are invited to create a simple design, then print and add to a collaborative “Wild Bouquet” of community designs using a burnishing method. Then view the stunning works created by members of the group. Challenge the grey matter, take the What’s That Tool? Quiz with the Shire of Mundaring, Chamber of Commerce and Mundaring & Hills Historical Society and be in the running to win the What’s That Tool? Trophy. Or learn how to publish a book, tell a story and find out about the “writing tools of the trade” including e-publishing with the writers from Katharine Susannah Prichard Writer’s Centre. Whether you're a complete beginner or skilled woodworker, Perth Wood School has everything you need to create your own masterpiece. David from Perth Wood School will be giving demonstrations of woodworking with traditional hand tools including saws, chisels hand planes and more. Enjoy the sounds of Kovu, the alternative folk project of Alexander Turner from 11:30-12:30pm. Brought up on the sounds of the West Australian folk scene, Alexander shares colourful stories that sit somewhere between home and elsewhere. Grace Saunders will be performing from 1-2:30pm. The singer-songwriter from Perth Western Australia combines jazz, soul, folk and classic rock influences to create a genre-bending body of work focusing on melody and lyrics. Join artist Mary Ann Dawson and be a part of this exciting annual project. Get creative and paint one, or many, of the hundreds of canvas leaves that come together to form the Shire of Mundaring Christmas Tree. Once painted the canvas strips are stapled to the large steel tree which stands proudly in front of the Shire Administration building to herald the start of the festival season. Midland Junction Arts Centre will come alive on the evening of Sat 24 Nov for a performance throughout the historic building showcasing the wearable artworks created by people of all ages and abilities. Awards are presented on the night for outstanding innovation, concept, craftsmanship and presentation. The evening will also feature an exhibition from renowned artists showcasing professional wearable artworks displayed in the East Gallery. Come and be inspired by artist, designer and educator Angela Ferolla and learn how to construct your own entry to this year’s Worn Out Worn Art (WOWA) Wearable Art Performance. Discover the art of printmaking in Week 1 and print your own colourful design onto recycled cardboard and materials. In Week 2 use your hand-printed card and paper to construct a sculptural amour-inspired wearable art piece and enter WOWA 2018! Entries due Friday 26 October. Midland Junction Arts Centre will come alive on the evening of Sat 24 Nov for a performance throughout the historic building showcasing the wearable artworks created by participants of all ages and abilities. Awards are presented on the night for outstanding innovation, creativity, concept, craftsmanship and presentation. An exhibition from renowned artists showcasing professional wearable artworks will be displayed in the East Gallery. Referencing the head pieces of ancient Egypt, Greek mythology, Vikings and modern day head wear featured in comics, movies and pop culture, Join Sarah Zel Chescoe in this full day workshop inspired by the beauty and complexity of headdresses through the ages. Using recycled and re-purposed materials, Sarah will guide you through construction and adornment techniques creating a spectacular wearable head piece to showcase in WOWA 2018. Entries due Friday 26 October. To celebrate the opening of the Antipodean Encounters > exhibition, join printmaker Vanessa Wallace to make a stab bound book with a traditional Chinese letterpress text cover using stitched book binding technique. To celebrate the opening of the Antipodean Encounters > exhibition, join textiles artist Carmela Corvaia to learn the art of feltmaking and create a felted object. Please bring one or two small (hand-sized) objects which have a simple shape such as a soft foam ball, chopstick or small saucer. Suitable for all ages, however all children under the age of 7 years are to be accompanied by an adult. Join us in the Mundaring Arts Centre Tent and help artist Si Hummerston to celebrate this annual white water river event by creating a life-size Zodiac boat using cane. Learn how to construct a large scale 3D structure using tools and joining techniques to tape, tie, cut and wire the ‘inflatable’ boat together. This collaborative community sculpture is a free activity ongoing throughout the day at this year's Avon Descent Festival. Fantastic fun for the whole family! Schools, photography and historical groups are invited to join us for a free tour of WOLDENDORP: A BLACK AND WHITE RETROSPECTIVE and glimpse these amazing black and white images of WA history through the lens of an iconic photographer.